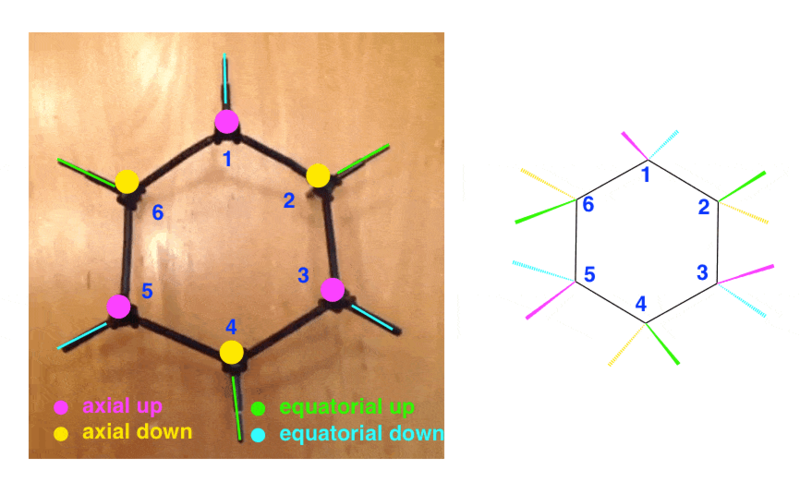 The Cyclohexane Chair Conformation: Identifying Axial, Equatorial, "Up", and "Down"
When I first learned about the cyclohexane chair (as we did in the last post) I was in denial about its importance in organic chemistry. 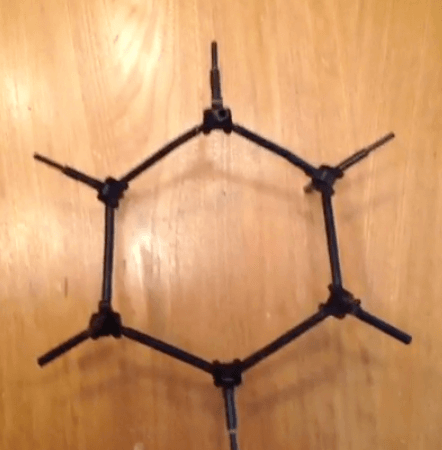 From an aesthetic standpoint, it bothered me that cyclohexane wasn’t a beautifully flat hexagon. The cyclohexane chair was so UGLY to me, and I felt disappointment that I actually had to learn about this hideous thing. If you’re a weirdo like me, then you might be having these feelings too, but you’re probably not. In any case in this post I want us to get as familiar with the chair as possible, and even learn to appreciate it – even if it might seem like an acquired taste. 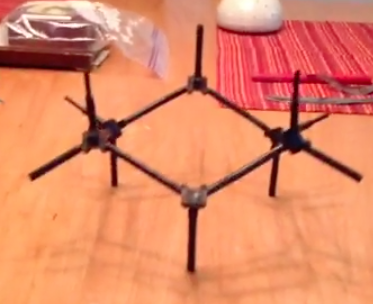 First of all, I’ve built a model of cyclohexane in its most stable conformation. Imagine you are in a tiny helicopter that is surveying the view of this model from a variety of angles. As we swoop from the top to the side to more of an “oblique” view of this model, to get an idea where everything stands in space (see the Vine above). However, as we learned in the last post, if the cyclohexane were actually flat, then we’d have considerable angle strain and torsional strain. And as we “fly” from the top to the side, we make two important observations: 1) the cyclohexane is not flat, and 2) in our “side” view, note how the view along each C-C bond reveals that there is a “staggered” conformation. Newman projection of the cyclohexane chair conformation. Notice how the orientation about each C-C bond is staggered. This is an important clue as to the stability of this conformation: unlike other conformations of cyclohexane, the orientation about each C–C bond is staggered, which means that torsional strain is minimized. Now let’s “swoop” a little off to one side, so that we’re looking at our model from a slightly oblique angle. 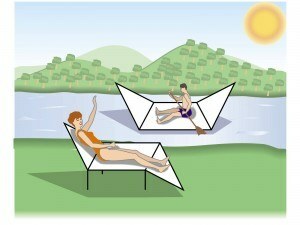 See how the model slightly (kinda-sorta) resembles a deck chair? Now let’s look at the chair a little more closely. First, do you see how some groups point straight up and straight down? Those are called the “axial” groups. See how axial alternates, up-down-up-down-up-down (12 o’clock to 6 o’clock and back again). Then, there are groups which point off to the side. We call these the “equatorial” groups, as they are in line with certain of the bonds of the ring. They alternate from “somewhat up” (10 o’clock and 2 o’clock, if you use a clock face analogy) to “somewhat down” (8 o’clock and 4 o’clock). Chair cyclohexane with equatorial groups highlighted in green. Now comes an important point – one which I had a hard time appreciating the first time I learned about chairs. It’s easy to see that the axial groups which point to 12 o’clock are “up” and and groups which point to 6 o’clock are considered “down”. Here’s the thing. Each carbon has one “up” group and one “down” group, and also one “axial” group and one “equatorial” group. So if a carbon is attached to a group that is “axial up”, the down group must be equatorial. Likewise a carbon attached to an “axial down” group must have an “up” group that is equatorial. It took awhile for me to appreciate that equatorial groups can be “up” and “down” too – even though they don’t point “straight” up and down. Let’s go back to the “top” view of the cyclohexane. The groups which are “up” will be coming “towards” us in the page – wedges , in other words, since we’re looking from the top down. The groups which are “down” will be pointing away from us (dashes). First, let’s take that top view of cyclohexane and put dots where the axial groups are (they’re either pointing towards us [pink] or away from us [yellow]). And let’s colour the bonds to the equatorial group whether they point towards us (green) or away from us (blue). Here’s the “top down” picture, colour coded for attempted clarity, and arbitrarily calling the carbon at the top “Carbon #1” and numbering clockwise. It’s hard to see “up” and “down” on the model when we’re looking at it from this angle because one group on each carbon will be occluded. Note that in the “Chemdraw version” we want to show that the groups are there (not hidden behind the carbons) so we cheat them out to the side a bit. Now let’s take this same colour scheme and map it on to the other views of the cyclohexane we’ve seen. Here’s the side-on (Newman) view, using the same numbering (although must numbers are omitted for clarity). And here’s the “oblique” view (the “normal” chair view , in other words) using the same colour scheme. I hope this post has been helpful in helping to identify “axial”, “equatorial”, “up” and “down” groups in the cyclohexane chair conformation. In the next post we’ll talk about how to draw a cyclohexane chair. P.S. 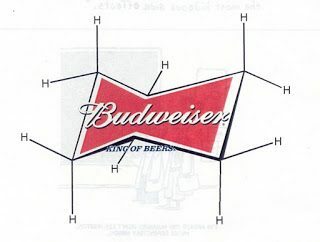 Sorry to disappoint, but the “Budweiser projection” of a chair is is NOT a good representation of the chair, as it misrepresents the C-C bond lengths. Thank you Margo, glad it was helpful!